The Prophet Ezekiel recorded a startling prophecy usually described as the “vision of dry bones.” He saw a valley filled with the dry, disjointed bones of thousands of human skeletons lying in open graves. As he watched, the bones began to come together and grow flesh. The corpses came to life and stood as an exceedingly great army. As the prophet continued to stare in astonishment, the Lord unveiled the meaning of the vision. The Lord revealed to him that the disjointed dry bones symbolized the whole house or nation of Israel and the horrible plight they would face while dispersed among the Gentiles. The graves represented the gentile nations into which they were forced to flee. The fact the graves were open portrayed that the gentile nations were not to be the permanent dwelling place of the Israelites. The coming together of the resurrected bones to form a great army is a prophetic picture of the magnitude of the miracle God swore He would perform in restoring the dispersed nation to its ancient homeland of Israel. Although Ezekiel confidently wrote of the restored Jewish state as “Israel” 2,500 years before, those who actually served as midwives to the rebirth did not decide on the name until the very day before! In December 1917, at the height of WW1, Britain found itself in a position to implement the Balfour Declaration. In the providence of God, General Allenby captured Palestine from the Ottoman Empire, ending 400 years of Turkish Muslim rule. At the end of the war, the League of Nations dismantled the Ottoman Empire and divided the Middle East between the Arabs and the Jews. Of the land apportioned to the Jews by the Balfour Declaration in 1917, only some 20% was actually given the Jews by 1921. The remainder of the promised Jewish homeland was awarded to the Arabs. This was due to an unexpected furor among the Muslims, who suddenly found the neglected and desolate land of Palestine to be of infinite value. By the end of the Great War, Britain found itself in the position of having promised all things to all people, and now it was time to deliver. The McMahon Hussein Agreement gave the land east of Damascus to Hussein of Mecca. The Sikes Picot Agreement divided it up between Britain and France. And, the Balfour Declaration gave Palestine to the Jews. The French and British solved their differences by the simple expedient of dividing up the territory by drawing borders, freehand, over the map of the Middle East. The French created Syria and Lebanon. The British carved Iraq and Transjordan out of what had been Mesopotamia. But when it came to Palestine, the Arabs dug in their heels and demanded that as well. Arab hopes had been raised by McMahon’s declaration of support for Arab independence, which the Arabs now claimed encompassed the whole Middle East. This was not good for the Arabs for they, as it so happens, have most of the proven oil reserves. In 1921, at the San Remo conference, the British said they had misspoken, and did not intend for the WHOLE of Palestine to become a Jewish State. They proposed instead to divide Palestine into two states, one Arab, and one Jewish. This was an outright lie and marked the beginning of constant concessions to the Arabs’ increasing demands. The British proposal to divide the area into two states was well received by the Jews. Chaim Weizmann who went on to be Israel’s first president, enthusiastically discussed the plan with King Faisal Hussein of Iraq, who initially gave his blessing, then withdrew his support in 1929. If the Arabs had accepted the 1919 plan, the Jewish minority may well have been absorbed into an Arab Palestinian State. That was not God’s plan for Israel. The Peel Commission in 1937 offered a similar two nation one state proposal. Again, it was accepted by the Jews and rejected by the Arabs. The irony is, had the Arabs accepted it, they would have won the battle for land over which they are currently fighting. And, they would have won without firing a shot and with the enthusiastic support of the Jews. The Woodhead Report of 1938 proposed an even smaller region of Jewish autonomy. The Arabs rejected it; the Jews supported it, although somewhat more reluctantly. The White Paper of 1939, offered by the British, was much more pro-Arab than any previous offer. At the time, the British were trying to win Arab sympathies away from the Nazi Party. The White Paper curtailed Jewish immigration, cut back Jewish settlements and was little more than a tacit recognition that Jews actually physically existed on the land. Amazingly, the Arabs rejected even this plan, which gives insight into what they really want. And what they really want is the total obliteration of any Jewish presence in what they continue to call Palestine. In March 1939, the British government actually asked the Germans to discourage travel by Jews to the Holy Land. According to official documents, Sir Neville Henderson sent a cable to the Nazi Foreign Office. It stated that a large movement from Germany of Jewish refugees, who without visas or any arrangements for their reception, were attempting to land in any territory that presented the least possibility of accepting them. The UN Partition Plan of 1947 offered by the UN gave a tiny portion of the land to Israel, the remainder to the Arabs, and declared Jerusalem an open city. This too, was rejected by the Arabs. The first time any partition plan ever offered by anyone was even looked at seriously by the Arab side was in 1968. That was after they had lost the West Bank and city of Jerusalem to Israel following their most recent attempt to wipe the Jewish State off the face of the earth. 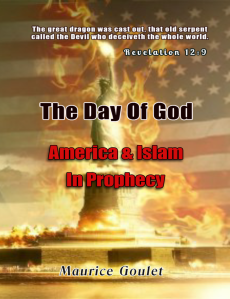 This is bible prophecy coming alive and functioning before us, with the whole world as witnesses. A terrible catastrophe is about to fall on all the Muslim nations that have attacked Israel. The warning was clearly stated in the bible, but no one was listening. The British immigration policy for Palestine underwent several modifications during the years between wars. As the Arabs objected to the influx of Jewish refugees fleeing Europe, Britain changed the rules to curtail Jewish immigration into Palestine. Britain’s need for Arab oil became more important than keeping its promise to the Jews. In 1930, the White Paper was passed through Parliament, effectively banning further Jewish immigration to Palestine. Certain elements within the British Foreign Ministry became hostile toward the Jews, especially some of the personnel working in Palestine. Because of this attitude, many of Jews who might have escaped the Nazis perished in the SS extermination camps. This kind of action not only sealed the fate of the Jews but of the British Empire. God warned the world 4,000 years ago of what He would do to the people or nation who harmed His people simply for being Israelites. This is significantly important when it comes to understanding the destiny of Manasseh, the son of Joseph. God promised Abraham, Isaac and Jacob concerning their descendants, “I will bless those who bless you, and I will curse the one who curses you.” The rise and fall of many great empires of history can be traced to how they blessed or mistreated the Israelites. The Jews suffered through the Holocaust where six million men, women and children marched to their deaths. After WW2, the Empire “on whose flag the sun never set” found itself being progressively destroyed. Today, the UK is only a shadow of what it was.The survivors emerged from the Nazis Holocaust a different people. The nations were shocked. For some, the shock quickly wore off and began to see them as “problem refugees.” Everything they owned, homes, property and bank accounts, had been confiscated before the war. The new owners agreed it was a shame, but did nothing to right the wrong. Greed proved once again to be a universal human weakness. The Jews of Europe became the Israelis of Palestine. Tough, disciplined and courageous in the face of overwhelming odds, they fought against British immigration restrictions to sneak themselves into Palestine by any means. They fought against a hostile Muslim population that was being flooded with new Muslim residents from all over the Muslim world. When the British disarmed them and heavily armed the Muslims, they smuggled weapons in with incredible cunning and audacity. They organized freedom fighting cell groups that gave the British more than they could handle. On May 14, 1948 the British withdrew and Israel claimed the land of Palestine to be the Jewish homeland. They proclaimed a new State and providentially named it Israel. The next day, they were invaded on all sides by the combined might of the Muslim world. Humanly speaking, there is no way to explain how the Israelis defeated the well-trained, heavily armed Muslim army that outnumbered them 10 to 1. Twelve hours before Israel’s declaration of Independence had to be signed and turned in, David Ben-Gurion heard the others in the next room arguing about what the name of their new nation would be. He could hear them through the walls tossing around possible names for the new state. He unknowingly fulfilled many ancient prophecies by writing in the name “Israel” at the top of the document. Never in history has such a thing happened. From being scattered across the face of the earth for 2,000 years, they returned to the same piece of real estate from which they were driven. They brought with them their culture, preserved through the centuries, their religious laws, their dietary laws and their customs. They kept alive a sense of nationhood that somehow survived in their hearts. The empires of the Assyrians and the Babylonians of this world all rose and fell. Israel alone, scattered without friend, land or flag, has endured to become a nation again. There are no Babylonians, Medes, Amalekites, Canaanites or Philistines left in the world, but Israel exists, as it did before Nebuchadnezzar. The cold war enabled the USSR to build the most formidable arsenal of weapons of mass destruction in history. That arsenal is now equipping the Muslim confederacy for their predicted war with Israel, just as Ezekiel predicted the Russian sons of Magog would do. On May 15, 1948, five well equipped Muslim armies attacked the tiny new State of Israel from all sides. The British trained and equipped Arab Legion of Jordan attacked and captured the power station at Naharayim. An Iraqi expeditionary force tried to ford the Jordan River in the area of Gesher. They were held back for a full week by the poorly armed settlers of Gesher. The Iraqis finally withdrew, choosing to cross the river at a ford held by the Jordanians. The Syrians actually began their attack on the night of May 14. They unleashed a devastating barrage of heavy artillery against the poorly armed settlements south of the Sea of Galilee. Arab radios announced with euphoric glee that the “War of Annihilation” had begun. The Arab Legions numbered more than 650,000 men. British mercenary officers of great renown led some of the Arab armies. All Arab armies were armed with the most modern of weapons and air power of the time. The Jews, on the other hand, had only 45,000 troops, most of whom were guerrilla fighters from the Haganah, Palmach or members of the Irgun and Stern groups. Under the British mandate, it was a crime punishable by death for a Jew to carry a firearm, although Arabs carried weapons openly. The new Jewish army had very little with which to defend itself. Chaim Herzog, the Jewish historian, estimates the Jews only had sufficient ammunition for 3 days’ fighting. The Palmach, the “Israeli Army,” for want of a more descriptive term, was able to arm only 2 out of 3 of its fighters. Against the Arab Legion’s modern jet air force, Israel had 20 unarmed Piper Cubs. The Arabs also controlled the only landing stripes in Palestine. The Arabs fought a very different Jew than those who went meekly into Hitler’s death camps, or lined up naked in front of ditches to be machine gunned by members of the SS Einsatzgruppen. Outnumbered by more than 100 to 1, and hopelessly outgunned, these survivors of the death camps, of countless persecutions in the Muslim countries, and of the hardships that life in Palestine had to offer shocked not just the Arab armies, but the entire world. Many Israelis charged into battle without a weapon to take one from the dead body of a fallen enemy. A few Jews from outside the country flew in on a wing and a prayer with obsolete German Messerschmitt fighters purchased from Czechoslovakia. With these planes and some cavalier volunteer pilots, they cleared the skies of enemy planes and turned back an Egyptian armored corps in the Southern Gaza Strip. With a determination rarely seen in any war before or since, the Jews met every onslaught. 10% of the total population of the new Israeli State fell in battle. But when the dust cleared, the Israelis controlled all the land set aside for them by the original Mandate plus half the city of Jerusalem. On June 11, 1949, the Arabs withdrew, and the Israeli State became a fact. God wants the world to know that his promises concerning his chosen people are his promises, not merely legends in an old book. By their very survival, the Jews prove God is exactly who he says he is, and his counsel shall indeed stand. He will do all his pleasure. The birth of Israel sets a pattern that is drawing us toward the end of days and the Day of God. Israel fought 5 wars in its short 50 years: The War of Independence, the Sinai Wars, the 1956 Suez Crisis, the Six Day War and the Yom Kippur War. In each war, Israel ended up with just a little more of the territory that God promised to Abraham’s seed forever. The Jews there are not about to surrender their sovereignty to the UN, the US or anyone else. They have made their last move. To this day that is more than apparent. The significance of Jerusalem’s end time prominence is clear that the Holy City will be in the center of world events in the end time. The growth of Israel from a scattered skeleton to a stored body is starting. As Ezekiel’s prophecy indicates: “There was a noise, and behold a shaking, and the bones came together, bone to his bone” Ezekiel 37: 7. Next, “the sinews and the flesh came up upon them, and the skin covered them above: but there was no breath in them.” Ezekiel 37: 8. From the sound of an earthshaking event (World War 1) the seeming dead nation of Israel was to gradually formulate a body, after which the spirit would be breathed into it. History records the birth of the nation of Israel beginning in 1917. Here is the amazing events which took place. In 1916 the war was going adversely for England. German machine guns and other advanced weaponry was cutting down their soldiers. Desperate to find a rapid method of manufacturing TNT and a smokeless gun powder, they turned to a brilliant Jew named Chaim Weizmann who invented a formula that made possible the rapid production of those vital materials thus changing the course of the war. In return, David Lloyd George, representing the British government, told Dr. Weizmann to name his price. He requested that Palestine be declared the homeland for the Jewish people. Consequently the Balfour Declaration was drawn up and signed on Nov. 2, 1917. Gradually the Jews began to gather (bone to his bone) and in 1917, it is estimated that less than 25,000 Jews lived in that land. By 2002 there were over 6 million and growing. But while God blessed Israel, Britain reneged on her 1917 treaty. In 1939, after much deliberation over the growing conflicts between the Arabs and Jews, Britain withdrew from Palestine. Shortly thereafter the National Council and the General Zionist Council proclaimed from Tel Aviv the establishment of the sovereign state of Israel. The date was May 14, 1948. David Ben-Gurion was appointed Prime Minister. The US and Russia recognized the new nation which, after much debate, was accepted as a member nation of the UN by a vote of 37 to 12. In 1967 for the first time since the Babylonian captivity, Jews took charge of Jerusalem. That has to be the most impressive fulfillment of Bible prophecy in 20 centuries. After planting the Israeli flag on the Dome of the Rock, Moshe Dayan did a strange thing, he decided to be conciliatory toward his Muslim captives and instead of keeping the site, he returned control back over to the Muslims. As a secularist Jew, Dayan thought it would help make friends of the Arabs, he succeeded only in making his friends angry. As the Arab neighbors outnumbered Israel 50 to 1, he knew that to not have done so would ignite a holy war. Some religious Jews still have not forgiven Dayan for his actions.